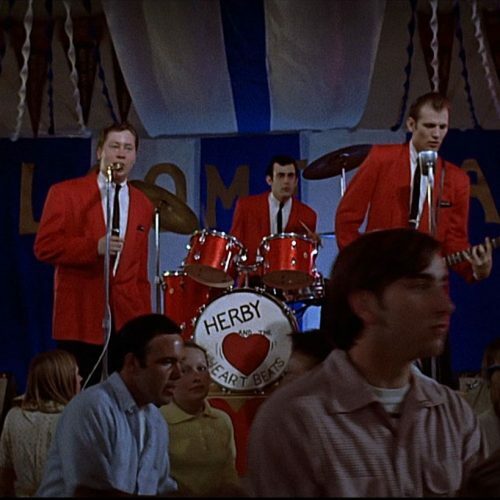 Flash Cadillac appearing as the band "Herby & the Heartbeats" in the 1973 film "American Graffiti"
Only Flash Cadillac, the best-loved 1950s oldies band in America. Flash Cadillac & the Continental Kids formed at the University of Colorado in 1968 as an oldies alternative to the contemporary rock sound. Lewd and rude shows at Tulagi, with crowd participation bits hatched by drummer Harold Fielden, quickly became the biggest events in Boulder. One year later, the band drove to Los Angeles to play the legendary Troubadour. Flash Cadillac came on last to a half-empty club and soon had the place packed with patrons dancing on the tables. The group quit school and hit the road, but Fielden and original “Flash” Mick Manresa soon returned home. The other members—Kris “Angelo” Moe (keyboards), Linn “Spike” Phillips III (guitar), Warren “Butch” Knight (bass), Dwight “Spider” Bement (sax) and a long line of drummers—decided to make a go of it as a real working band, fronted by Sam McFadin, a fan from Colorado Springs. Flash Cadillac gained instant popularity within the music industry. 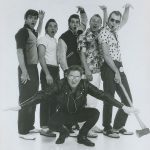 The band earned acclaim in the movies, appearing as the sock-hop band in George Lucas’ American Graffiti and in a scene in Francis Ford Coppola’s Vietnam epic Apocalypse Now. The group also worked on television’s Happy Days and American Bandstand. “Dancin’ (on a Saturday Night),” recorded for Epic Records, cracked the Billboard pop singles charts at #93. Flash Cadillac gave the big time one more shot on Private Stock Records, gaining hits in “Did You Boogie (With Your Baby)” and “Good Times, Rock & Roll.” By the mid 1970s, the band purchased a little ranch near Woodland Park and built up the facility into a 24-track studio. 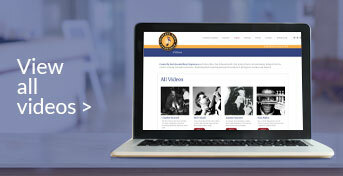 In 1992, Flash Cadillac was reborn, performing pops concerts with symphony orchestras across the country. Over the ensuing years, Flash Cadillac lost cylinders with the passing of Phillips, McFadin and Moe.